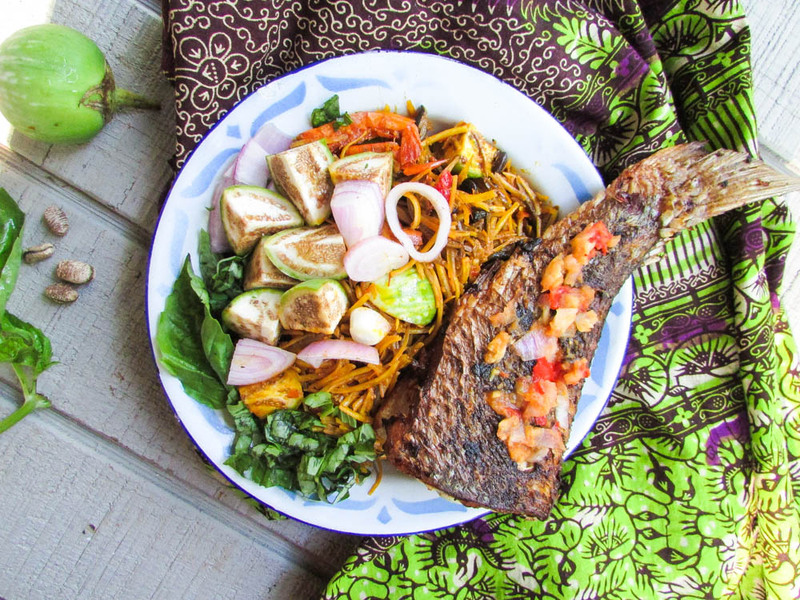 This particlar recipe reminds me of my mother making abacha with akidi. Akidi is a small tiny bean seed. It looks reddish or black, and it is mostly used by the Igbos’. Anyway, I needed some akidi and I could not source any beans with it’s resemblance, so I called my sister in Nigeria for a few cups. This recipe gave me that nostalgic feeling of visiting the village with my folks. The sound of the mortar while the ehuru is being pounded, the smell of the ukpaka… I don’t know why it reminds me of palm kernel pomade. This is a dish eaten mostly by the Igbo's of Nigeria. Bring some water to a boil and pour over the dry abacha; promptly drain, fluff with a fork, or your fingers; then cover and set aside. 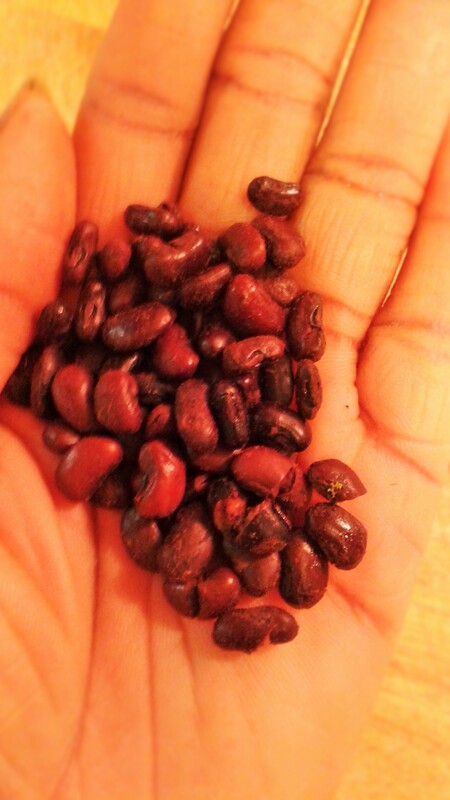 Toast or roast the ehuru seeds over oen flame or in a pan. finely blend it with half of the dry prawns and ose. In a pot, pour in some palm oil(do not heat); then strain in the liquid from the ngo'(Recipe in blog). To use potash or baking soda, Soak the potash or baking soda in some warm water and let it dissolve; then strain with a sieve into the oil(the baking soda does not need straining as it melts easily). Stir the oil and thickening agent quickly to make a slightly thick liquid known as ncha in the Igbo language. Add the ogiri(if using) into the oil and melt with a wooden spoon. Pour in your blended Ehuru mixture and bouillon if using any; then stir in your meats along with the ukpaka, and akidi. Combine until the oil has touched every ingredient. At this point, add the abacha, grinded crayfish, pepper, half of the chopped utazi, the remaining sliced onions, and the egg plants. Check for seasonings and combine all the ingredients into the pot by stirring carefully. Garnish with the rest of the utazi and serve. 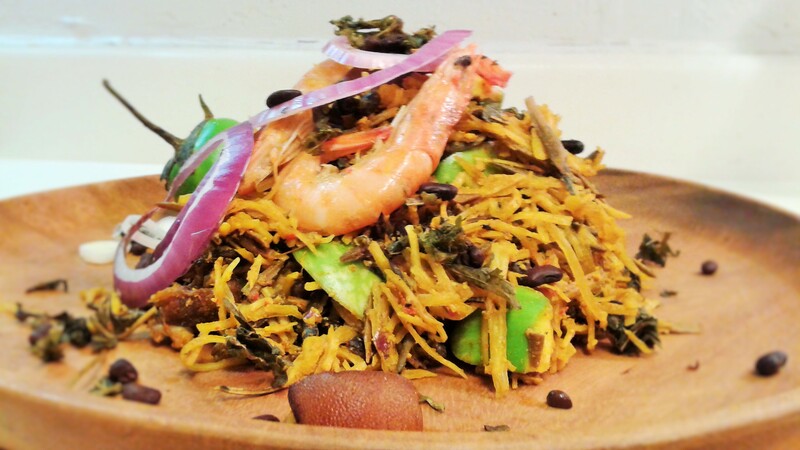 This entry was posted in Appetizers, Uncategorized and tagged Abacha, abacha recipe, African salad, African salad recipe, Cassava recipe.